A comprehensive model at a great value, this torso allows students to study the structure all human body systems, including both male and female genitalia. A removable female reproductive system includes a three-month fetus correctly positioned in the uterus. A four-part male genital insert is also provided. The torso's exposed neck and back, from cerebellum to sacrum, enables study of the vertebrae and surrounding structures. 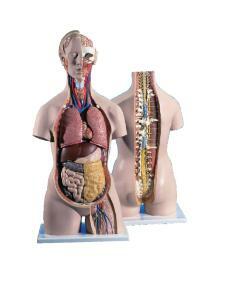 Additional removable features include a six-part head with a four-part brain half, four-part intestine system with small intestine, large intestine with pancreas, transverse colon, and cecum flap. Partial musculature is also depicted. Includes a teaching guide.